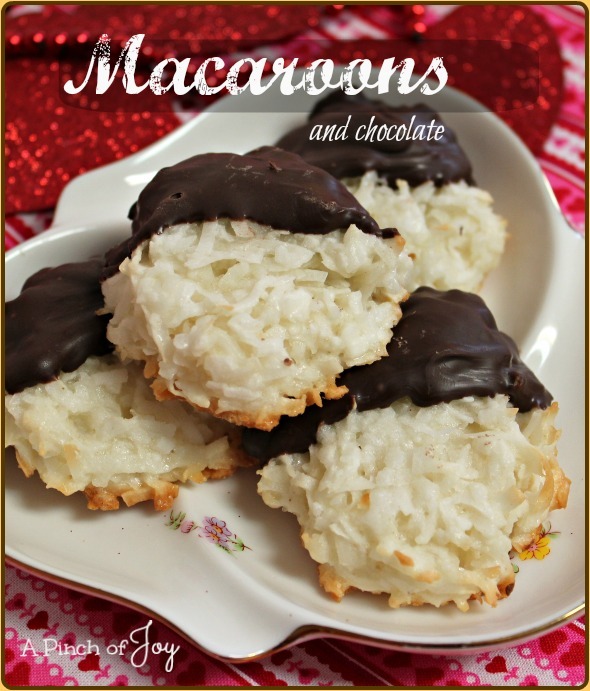 Coconut Macaroons with Chocolate would be a perfect Valentine gift. Or an any time treat! Cookies are extra chewy because they are loaded with coconut. I love coconut. And chocolate. Put the two together – heavenly! My brother Jay was also a big coconut fan and between the two of us we could consume a bag of coconut in an afternoon. Much to Mom’s consternation. And to the younger kids loss. Because no matter where Mom hid the coconut for her planned culinary endeavors, Jay and I would find it. Eventually she quit buying it. The four other siblings missed the clandestine consumption of coconut! They had to wait until later to find the joy! I’ve learned to discipline myself and leave the bag unopened until time to use it. This recipe is great since it uses the entire bag because opened bags with “leftover” coconut – gone! The coconut macaroon recipe is quite straightforward and very easy to make. Parchment paper can be used to line the baking sheet instead of spraying with baking spray. Use a slightly heaping tablespoon of coconut mixture for each cookie and place them about an inch and a half to two inches apart on the cookie sheet. Use the spoon (and fingers if necessary) to shape the cookie. If cookie is mounded, gently press the center down so the cookie is slightly flat. The cookie will bake in the shape it has when you put it in the oven. Note the oven temperature of 325 F and do not skimp on the baking time allotted unless the bottom begins to darken from golden brown. This allows the coconut egg mixture to develop maximum flavor and chewiness. Let set for a few minutes to cool before trying to remove the cookies from the pan. Normally this recipe yields 3 dozen small/medium macaroons. For Valentine’s Day I used a silicon heart shaped baking mold. The hearts are 2 ½ inches across at the widest point. I patted the macaroon mixture into the mold being careful to keep it uniform and about ½ inch thick. I baked it for the same amount of time and gently lifted one to see if bottom had begun to turn golden before setting the pan to cool. Six hearts used about half of the mixture and allowed me to make about a dozen large macaroons as well. Chewy coconut macaroons half covered in creamy chocolate make a heavenly treat. 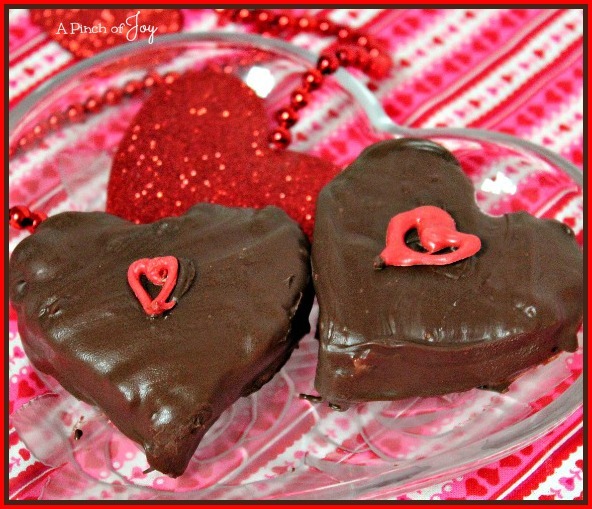 Bake in a heart shape for Valentines Day and cover the heart with chocolate for a special treat! Combine coconut, sugar, flour and salt in large mixing bowl. In small bowl, lightly beat egg whites with flavorings and add to coconut mixture. Spray baking sheet with spray (preferably baking spray with flour). Drop macaroon mixture by tablespoonsful onto baking sheet, spacing 2 inches apart. Bake 20 minutes or until edges are golden brown. Remove from oven and cool about 5 minutes before removing cookies to wire rack. After cookies are cooled melt half the package of chocolate candy coating at a time in microwave following directions on package. Use one half before melting more as you may not need the entire package. Carefully dip cookies as shown, let excess chocolate drip off and set on rack to harden. Decorate as desired or leave plain.